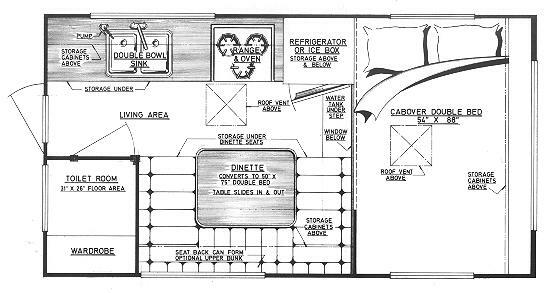 Living area headroom 6'3" to 6'7"
Cabover headroom (deduct for mattress) 32"
Fresh water capacity (standard) 20 gals. Dry weight (estimated) 1400 lbs. At first glance you'll think the Cascade is much larger than 9'. The fully enclosed toilet room is spacious and unusual for this size. The kitchen area is a delight, with countertop space on both sides of the sink and storage cabinets in every nook and cranny. Large window areas allow plenty of light and air to enter, and make the already large cabover bed area appear even larger. Four or more adults can sleep soundly in the Cascade's full-length beds. You'll find careful attention to creature comforts in all Glen-L models because our designers are aware, through personal experience gained over the years, what should go into your recreational vehicle. But, the beauty of building it yourself is that you can add those customized touches and features that even we may not know of to further add to your satisfactions. By utilizing our comprehensive plans and adding those little "touches" of your own, you will have truly a "one-of-a-kind" unit, all at a cost far below what you would believe possible. 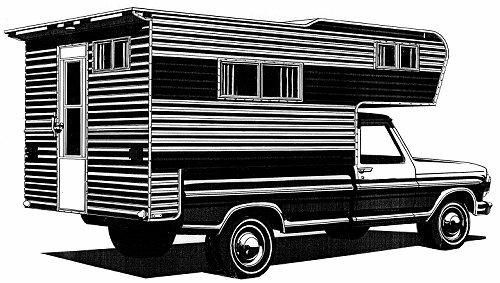 So get a camper the way you want it - by building it yourself.